Journey to the Sacred. Finding Sanctuary on the Inca Trail. Where does my passion for feminine, organic architecture come from? I heard this question ring in my consciousness, asking me to share with all of you more of what is seeking to resurface in our hearts, spaces, and lives. My ancestors, like many Indigenous traditions around the world, felt an ancestral pull to honor the body and spirit of the earth and build in harmony with the land. It is this sacred connection to land and cosmos that inspired them to design an architecture that flows not against, but rather, in harmony with the rhythms of the earth and cosmos. Honoring contours of earth, their structures adapted to the formations of the landscape. 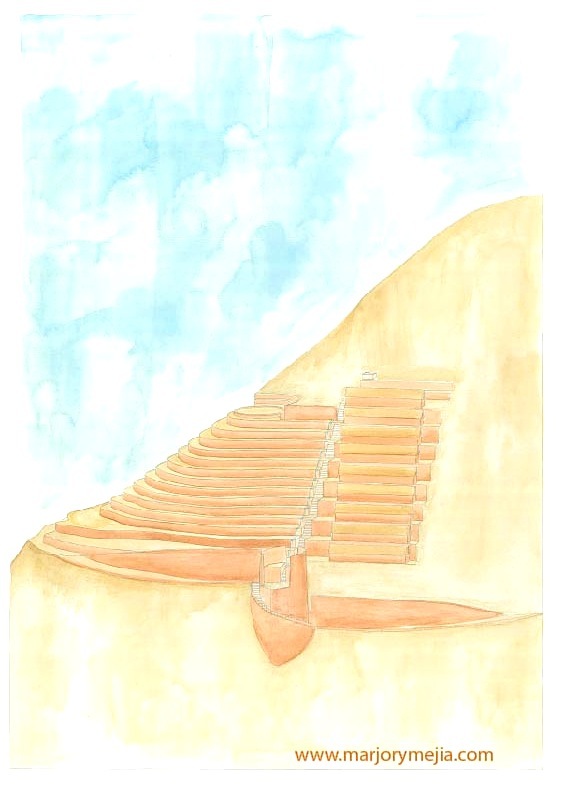 Their architecture didn’t seek to dominate the land but to enhance its beauty, growing out of the earth in a sculptural gesture that embraced the heavens and played with light during important astronomical events such as the solstice and equinox. Like many, I did not grow up in direct contact with this ancestral wisdom. It did, however, and to my surprise, slowly and gradually emerge, surface, show signs of aliveness in my life, path, and work. 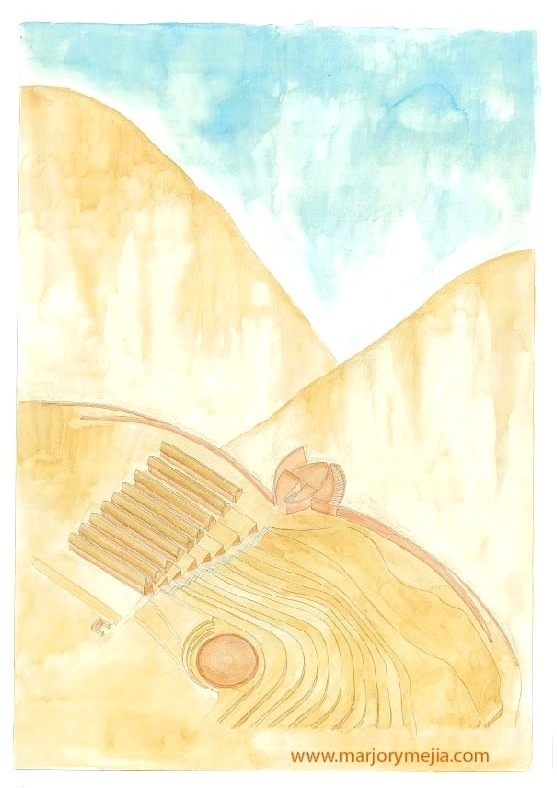 My architectural thesis ten years ago became the sacred trail and ground for my exploration of another way of dwelling and being with Mother Earth, one that humbly echoed the ways of my ancestors. I feel I’m coming full circle exploring the healing power of architecture, much like one circle of growth in the bark of a tree. 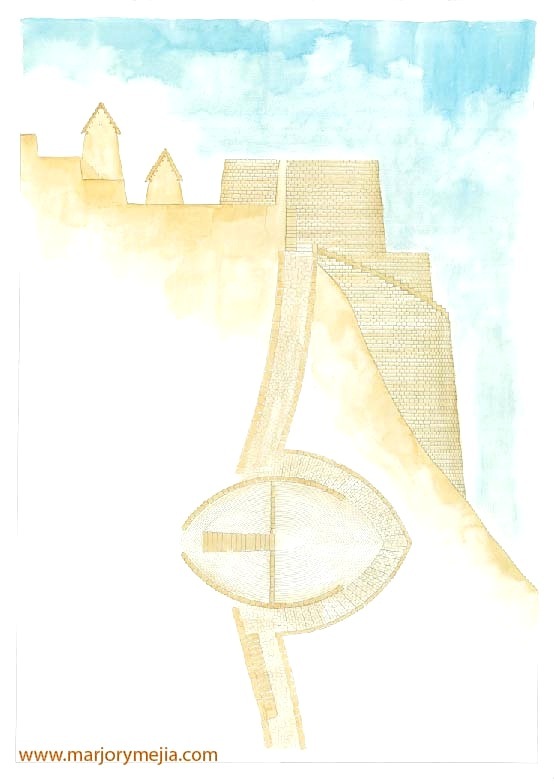 The question I asked myself more than ten years ago for my architectural thesis was how to recover the language of the sacred through architecture’s power to create an experience that expands our awareness and consciousness. In other words, could modern humans who lived in desacralized space re-new their relationship with the earth and learn to reintegrate the sacred in our every day life? The following drawings represent a moment on the Inca Trail, a journey challenging the traveler to mindfully experience life and its many facets as rituals imbued with the sacred. 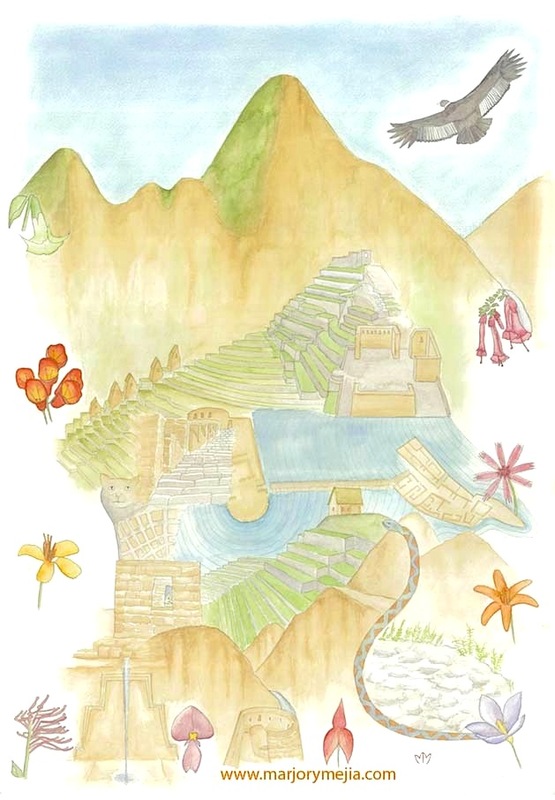 Wiñay Wayna sanctuary study by Marjory Mejia. 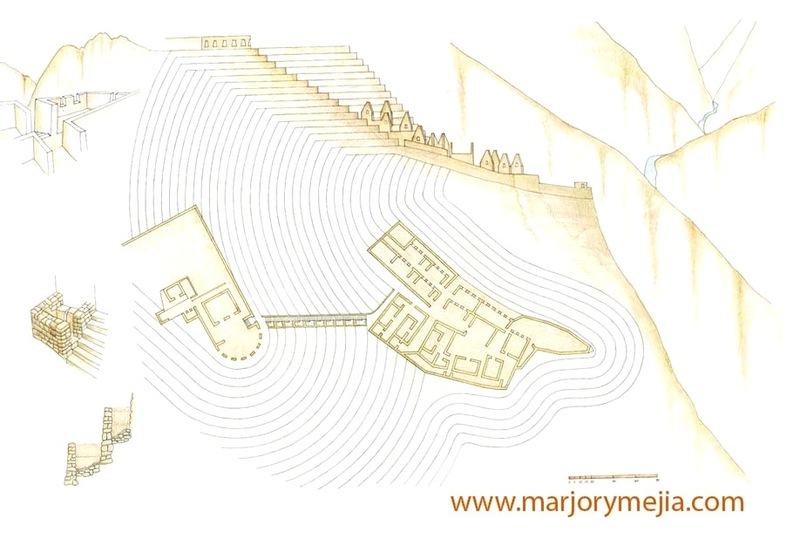 Plan, oblique & details for the documentation of community ruins on the Inca Trail. 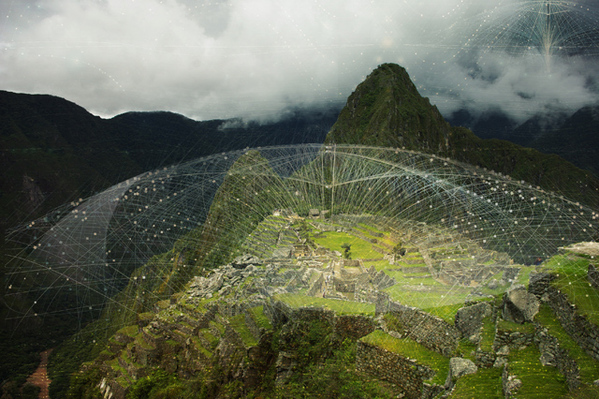 The research for the thesis results in deeper understanding of sacred space in Inca culture. 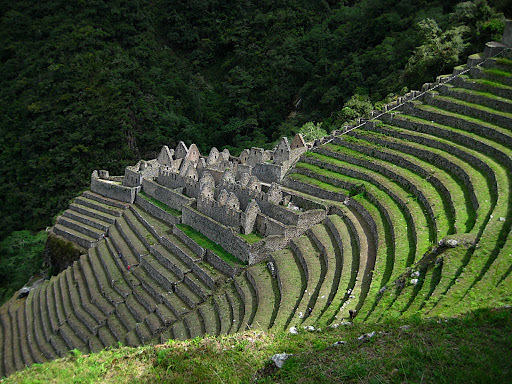 Wiñay Wayna was a ceremonial community that integrated temples, residential areas and agricultural terraces with fountains that celebrated the flow of water and beauty of the landscape. Drawing collage of Inca Trail by Marjory Mejia. The Inca Trail is a 27 mile path (4 day journey) that leads to Machu Picchu, with various ceremonial stops along the way. Like other pilgrimage paths, it is a physical, sensual, and spiritual journey. The walk on the trail involves the movement of the body through time and space, revealing an intimate connection with the landscape. It is in the spirit of this natural and cultural landscape context that I designed the sanctuary. Condor Contemplation Center by Marjory Mejia. Plan | Section | Elevation. The sanctuary / place of refuge embraces the trail, which travels through the project in an architectural promenade inviting the traveler to descend the path that terminates in the condor. The condor is a structure that opens up to the elements and holds the site with its wings, offering framed views of the landscape & a space for contemplation and remembrance. There are steps that wrap around its head and connect the two levels of the wings, which adapt to the topography of the site. Axonometric view of sanctuary by Marjory Mejia. The program includes spaces for eating, sleeping & meditating, which acquire a new dimension, one filled with the realization of the sacred. The stone circle gathers around the fie and sits on a natural plateau with terraces that cascade and ripple down the mountain. This space opens up to the east direction and offers views of the site and surrounding mountains. 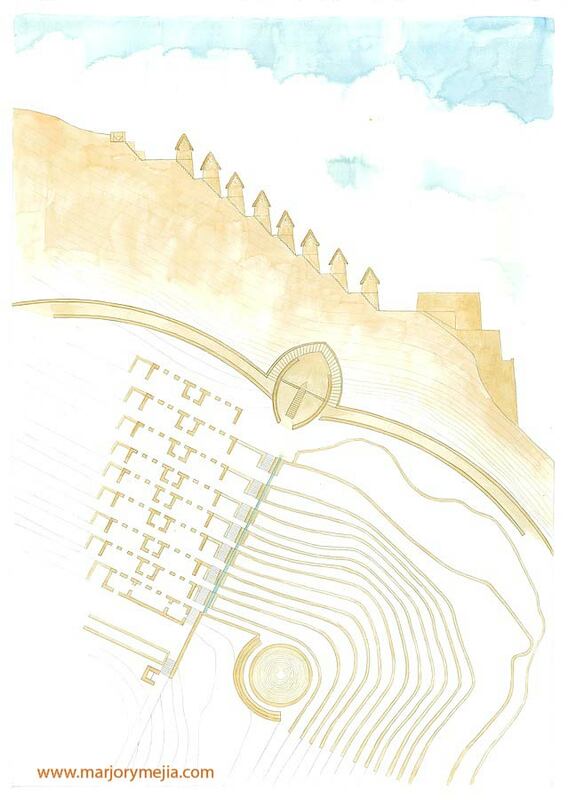 Axonometric view of Sanctuary by Marjory Mejia. The thesis excavates the Cosmovision of the region and conceives the place of sanctuary / refuge as an organism that grows from the earth as part of the landscape. This Inca Cosmovision as expressed and revealed through the materiality of the place of sanctuary / refuge, is able to heal the fragmented soul of the modern traveler, visitor, pilgrim. Some may think this Andean Cosmovision and consciousness is dead. It isn’t. It dwells in the hearts of many, awakening. There is a myth, an Inca legend that beautifully predicts the reawakening of Inca consciousness from deep sleep. They say Inca consciousness went to sleep with the oppressive conquest and subjugation of its culture and wisdom and that when Inca consciousness reawakens, there will be a new dawn, a new order, a reborn awareness rising from the depths of our being. PREVIOUS POST — Feel this resonance. I am so glad to read this post. I did not know you well but now feel more like kindred sisters! I am too into sacred architecture, but not as deeply as you, and in Mayan and Incan prophecies. I wish I had you design my new office!